I'm a big sucker for creative marketing, especially when it feels as though you are getting something in return. What more tangible thing is there to offer than land ownership? Laphroaig Scotch caught me hook line and sinker when they offered me a lifetime lease on the Isle of Islay, home of the Laphroaig distillery. The fact that I could view the exact location of my plot of land on a map was gravy. 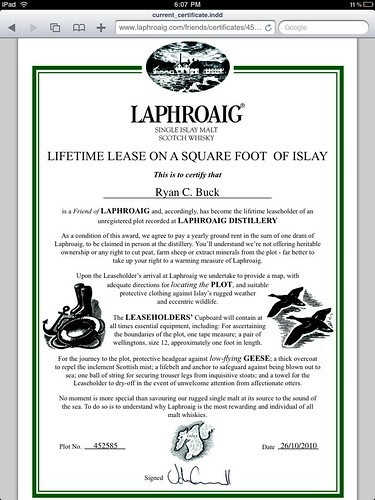 Each new package of Laphroaig comes with instructions on how to claim your lifetime lease. The idea goes, everyone who buys a bottle of Laphroaig is entitled to a square foot of land. All you have to do to claim your spot is to register as a friend of Laphroaig. Of course I know this is volunteering some information, but who cares?! After I registered I received a certificate with the lease arrangement whereby I can collect "rent" of a dram upon visiting the Islay. A copy of my certificate is below. What intrigued me most about his proces was the ability to see my little plot of land. 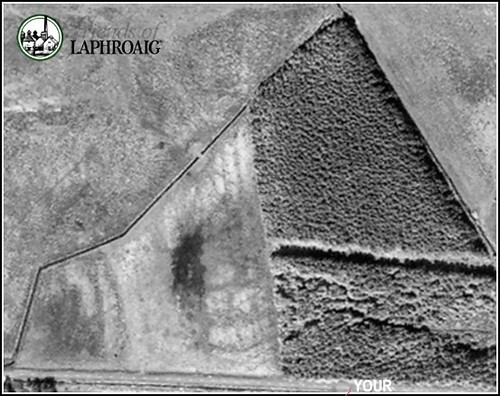 Laphroaig has set up a cool tool which let's you zoom in to the distillery grounds and see your square foot of Islay. Unfortunately it looks like my square foot falls in a bit of a blind spot zone as you can see in the picture below. Look in the lower right corner. Well, at least I can see ABOUT where it is and when I make it to Islay one day I'll be able to see it, because, don't you see, instructions on how to find your plot are part of the lease agreement too.